Towering Malay and National Youth Awards were recently accorded to two agropreneurs under the Department of Agriculture (DOA)'s guidance. Both awardees were among the first to use the AgriBazaar portal to conduct their agribusinesses. A Melayu unggul awardee, Jumenah Saat, 53, from Kemang Darat, Batu Pahat produces snack foods and has succeeded in penetrating the Japanese market using information and communications technology via AgriBazaar. Harrani Dayat, 32, of HBD Agrotech, who operates vegetable fertigation projects in Kota Tinggi and Batu Pahat and won a National Youth Award 2005 (Agricuture category), is another active user of AgriBazaar. The two are among the many success stories resulting from AgriBazaar — a far cry from the story entitled "Ensuring a fruitful AgriBazaar". Among the notable successes to date is a steady growth in registered users (over 4,700, including 114 from overseas) from 14 business types (29% bona fide farmers), with well over 400 active B2B/B2C product offerings (buy, sell, business opportunities and excess stocks) for over 400 categories of farm produce/agri-products. As of June 5, some RM8.95 million worth of virtual trades were transacted — and are growing by the day. Not bad for a 21/2-year-old baby. Since its introduction in July 3, 2003, AgriBazaar has blazed a trail in e-commerce application in agriculture — a bottom-up approach initiated through a pilot project in the Batu Pahat district. Adoption by market players has been laudable and has helped the project cross boundaries (nationwide, regionally and globally) and expand quickly without any national rollout plan being planned at the time. The strong, continuous political will accorded to this initiative is very encouraging. This is the result of the Prime Minister's keen interest in revitalising agriculture — to bring rural farmers benefits from development efforts to ensure they are not marginalised. His efforts are a continuation of Tun Dr Mahathir Mohamad's work during his final years in office. ICT global experts attending the Asian Federation of Information Technology in Agriculture and World Congress on Computers in Agriculture 2004 Conference in Bangkok and the United Nations Conference on Trade and Development Workshop on Open Source in Geneva have voiced their strong backing for AgriBazaar. They describe it as a laudable initiative that has succeeded in bridging the digital divide through an empowerment approach for the farming community. AgriBazaar provides the value-added element for agriculture efforts and agro-based/rural industries. This way, the rural/digital divide problem can be solved automatically and on a sustainable basis. 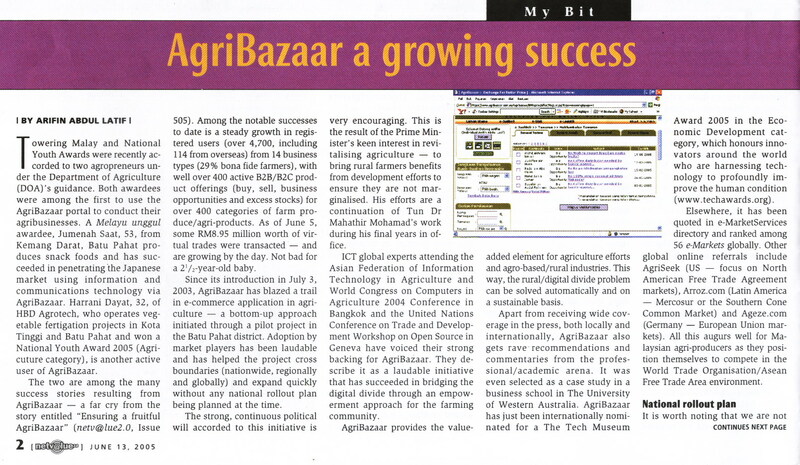 Apart from receiving wide coverage in the press, both locally and internationally, AgriBazaar also gets rave recommendations and commentaries from the professional/academic arena. It was even selected as a case study in a business school in The University of Western Australia. AgriBazaar has just been internationally nominated for a The Tech Museum Award 2005 in the Economic Development category, which honours innovators around the world who are harnessing technology to profoundly improve the human condition ( http://www.techawards.org/ ). Elsewhere, it has been quoted in e-MarketServices directory and ranked among 56 e-Markets globally. Other global online referrals include AgriSeek (US — focus on North American Free Trade Agreement markets), Arroz.com (Latin America — Mercosur or the Southern Cone Common Market) and Ageze.com (Germany — European Union markets). All this augurs well for Malaysian agri-producers as they position themselves to compete in the World Trade Organisation/Asean Free Trade Area environment. It is worth noting that we are not short of interested parties lobbying to acquire AgriBazaar and turn it into a private business. The interest shown by the corporate sector is proof that AgriBazaar is a success. However, unlike other e-commerce portals/initiatives, it is our express wish to maintain AgriBazaar as a socio-economic project. Hence AgriBazaar's national rollout plan shall be among the main features in DOA's projects for the Ninth Malaysia Plan (2006-10) which sets out to strategically realign/redevelop the agriculture sector into a modern, dynamic and competitive sector capable of becoming the "third engine of growth" for the country. This realisation stems from our painful experiences during the Asian financial crisis of 1997/98. With all these positive developments, I believe AgriBazaar shall meet its objectives and even beyond that, as fully endorsed by the Prime Minister himself and his Cabinet. I am glad this is shaping up well during my time as the ICT chief in the DOA's 100th year of existence. Finally, the DOA has arrived, spearheading e-commerce in agriculture (with the Malaysian Institute of Microelectronic Systems) on the "ICT in Agriculture road map". The portal has become a convenient and fast marketing channel for all market players to conduct their agribusiness deals. Its motto "Exchange for Better Price" has managed to draw in the rural community. We view it as having the potential to go beyond the national boundaries — with foreigners already registering and actively posting offers/enquiries. Yes, the trade potential is now a reality — with valid business opportunity offers coming not only from the Asia/Asean region but also from as far away as the Mercosur and EU markets, Canada, Morocco, and countries in the Commonwealth of Independent States, among others. Trade potential through AgriBazaar is not taken seriously by certain quarters. However, the last few months saw a surge in direct export/import offerings, aside from serious enquiries via e-mails and user feedback. Perhaps our presentations in Bangkok and Geneva have succeeded in drawing some interest among foreigners to conduct agri-trade with Malaysians. From the very start, I have pioneered posting such "biz opportunity" offers on the portal, and have been receiving quite a lot of messages/responses through "offers feedback" (seven pages of active offers/enquiries) — mostly from foreign traders offering to establish business contacts through me. This proves that the scepticism shown by some towards AgriBazaar's ability in promoting export/import of agri-produce and products is unfounded. Large Brazilian fresh fruits exporter interested in exporting exotic fruits from Brazil. Malaysian in Calgary, Canada, searching for joint-venture partner to export Canadian beef. Company from West Sumatra hoping to find joint-venture partner to manufacture and export virgin coconut oil. In fact, it's not a case of lack of interested parties to import our farm produce but rather our inability to meet their demands. For instance, no taker responded to requests from a biotechnology company in Taiwan looking for 10 tons/month of dried roselle calyx. An importation enquiry for Noni juice from a large trading company in Poland also met the same fate. Maybe we have not achieved the critical mass needed, especially for those who are ready, competitive and brave enough to spread their wings globally, but the potential is there, right now! Last but not least, the AgriBazaar portal is developed for all farmers, livestock farmers, fishermen/aquaculturist, small and medium-sized food processors, and other market players. Use it as an alternative marketing channel, managed in virtual space and aimed at speeding up the processes of marketing agri-produce, agri-products, food products, agro-based and rural products. Adhere to the Prime Minister's call so that it can expand speedily and prepare our market players to be more productive as well competitive to trade globally.